Just as you can learn by our video, the welcoming starts in Naples, the perfect place where start your tour. Here you can feel some of the famous traditional features: the legendary hospitality, the incredible and natural beauty, the great clime, the history and famous culinary art. Touring Naples, you will have the opportunity to visit some artistic treasure of the city: the historical centre, a patrimony under the tutelage of UNESCO, the Archaeological Museum, the places of medieval and renaissance power located around the Castel Nuovo and Royal Palace, churches, various buildings, catacombs and underground passageways, the unforgettable waterfront from Castel dell’Ovo to Posillipo. The hilly area of Vomero offers masterfully restored buildings like the Capodimonte Royal Palace and the Certosa (monastery) of San Martino, museum collections amongst the most important in the world. Unusual and surprising is the exploration of the new homes of contemporary art: monumental structures like the PAN, Palazzo delle Arti Napoli, the MADRE, Museo d’Arte Contemporanea Donnaregina (Donnaregina Contemporary Arts Museum), and the unique artistry of the metro stations that evidence the original horizons of farseeing cultural politics… and much more that you can choose by OUR SUGGESTIONS. The origin of this incredible and beautiful city are lost in time. The most credible hypothesis is that the beginnings of the city dated in the 9th century B.C. When the greeks colonised what today is the gulf of Naples. In the beginning of the VIII century the greeks found the town of Cuma (Phlegrean area) north of Naples. Between the VII and VI centuries they start move south to create the first settlement of city named Partenope, in fact the greeks used this name because the coast reminded them the beautiful mermaid Parthenopes, a mythological figure half women and half fish. Then the city started to expand after the greeks victory over the Etruscans in 474 B.C. , the period when the name was changed in Neapolis (new city). Very soon the greek town along the coast, included Naples start to face a dangerous invasions from the populations of Sanniti & Lucani, forced to ask help from Roma. After the Roman victory in Capua in 334 Naples was liberated To receive the status of Allied city. But in 406 after the fall of the roman empire, in Naples and the all Campania region started a very long seasons of different dominions. At first Naples became the capital of the duchy of Benevento in 1137 the duchy fell into the hands of the Normans, then in the German Sveva dynasty (Hohenstaufen), and for this Federico II was the most worthy king of this dynasty. During his reign the Federico II “University of studies” was founded (1224) to rise Naples in one of the most important intellectual center in Europe. The dominions continue with the Angiò, Aragonesi, the Spanish dominion, the longest one, with the viceroys (over 200 years), the Bourbons, than Bonaparte, but the ruler was is brother in law Gioacchino Murat, then the Bourbons retake power again, until 1860 when Italy was finally united, and the powerfull reign of two Sicily, with Naples is capital city ended. It is impossible to explain the different soul’s of this incredible city, many famous artists and travellers fall in love completely try to find on answer, people like Sthendal, Goethe, Charles Dickens, Melville, Alexandre Dumas and many others. Many itineraries (cultural, historical or gastronomical) take you in different part of the city. A trip in the underground of Naples for example, is on exciting experience that reveals the secrets, history and mythological legends of the city, still today no one knows the exact dimensions of the “dark” Naples. The artistic and historical centre is a patrimony under the tutelage of Unesco. The other itinerary that you can’t miss is the gastronomic delicacy of the typical Neapolitan cuisine. Home made pasta with delicious cherry tomatoes, fresh fish from the bay, buffalo mozzarella, and of course the world wide famous pizza margherita invented in Naples in 1889 to honour the queen of Italy “Margerita di Savoia” when she was visiting Naples. The finish touch it is always on espresso Neapolitan coffee very strong, we suggest, if you like sweet, to accompany the espresso, with the “lady” of Neapolitan pastry the “sfogliatella”, this delicious pastry was invented in the 18th century, filled with sweet aromatic ricotta cheese and candied fruit. The bowels of the city is the Greco-Roman historical centre with the two decumans, superior and inferior, the piazza of the Gesù nuovo is the entrance gate to this bowel it is here that the pulse of the city is best felt. The alleys, the artisan work shops, the many artistic beauty that surprise you in the least unexpected streets. From historical centre, in 10 minutes walking distance, you face the huge and spectacular Piazza del Plebiscito where the cultural events and concerts are held. The piazza is the site of another colossal masterpiece, the royal palace. The construction was begun in the early 1600’s (under the Spanish dominion) from a project by Domenico Fontana. Attached to the royal palace is the marvellous opera house theatre S.Carlo inaugurated in November 4 1737 (the oldest in Italy) and named after the king Charles of Bourbon. Near by you have the chance to start the ideal shopping trip, begins in Via Toledo and then goes on to the Via Chiaia, Calabritto, Filangieri e Dei Mille, with the most elegant and prestigious stores. Then you move on along the very famous Via Caracciolo where you can enjoy a charming promenade with beautiful scenery of the bay of Naples. 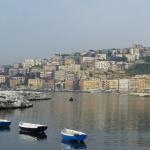 From this avenue you move towards Mergellina area, to start the beautiful scenic Via Posillipo, that goes up on the hill. Posillipo the old Pausyllipon (greek for pain reliever) this promontory offer to the visitor a sublime scenery of Naples with is gulf, a bay considered one of the most spectacular in the world.